Back when I was at university, I had a professor that was somehow every university academic cliche you could imagine; he was softly spoken, as far from a fashionable dresser as you could imagine (tweed jacket and all), and had hair that didn’t look like it was ever brushed, much less cut. Related reading: Matt's review of the first two games in this trilogy on PlayStation 4. This professor (of philosophy, no less) would never look at you in the eye when you spoke to him. Not because he wasn’t friendly, helpful, or because he was shy, but simply because he was lost in his own head most of the time, and the real world was basically a place that never really registered with him. He was also one of the best professors I ever had, because he was so incredibly attuned to thinking that you couldn’t help but learn simply by being in his presence. I bring up my academic past because Zero Escape: Zero Time Dilemma is basically the same thing. It’s smart - incredibly so - and it knows it’s smart. It’s also apparently completely unaware of how alienating and unwelcoming it can come off as to its players. It’s a game that makes certain assumptions - most particularly that we’re emotionally connected to the characters and their situation - that it really shouldn’t be making. And it asks players to completely invest in the game well before it makes any kind of promises that there are going to be meaningful payoffs or insights for the effort. Firstly, though, I have to deal with the most immediate thing you’ll notice; this is one hideously ugly game, and that hurts it. 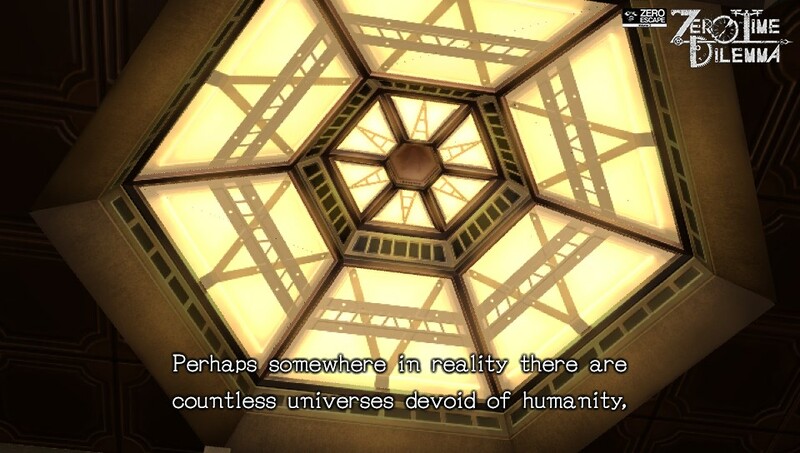 The two predecessors to the game; Nine Hours, Nine Persons, Nine Doors, and Zero Escape: Virtue’s Last Reward, were both simple games, but there was an elegance to the 2D character art that would pop up during conversations (like a standard visual novel), and that was enough to have us connect with the characters and the horrible situations that they find themselves in. For anyone who hasn’t played these games yet; they’re basically the videogame equivalent of the Saw film franchise. Each time, a number of people are imprisoned within a deathtrap environment, and forced to play out games, where the losers inevitably die, and it’s impossible to escape without there being some losers. What is absolutely essential in making these games work (and also the reason the earlier Saw films are far better to the later ones), is that the audience cares. If we feel no empathy for the characters, we don’t care about the mess they’re in. Zero Time Dilemma dropped the lovely 2D character art in favour of the most clumsy 3D character models I’ve seen this side of Skylight Freerange. The vacant stares into space and stiff animation barely approximates human beings, and it’s hard to feel empathetic towards them. Furthermore, because the budget was so clearly constrained to the point that the developers couldn't afford to animate every action the characters take, the camera constantly cuts away to display the bland, empty environment when something active is happening to the characters. So much of what goes on we can only infer from the sound effects, and that's blatantly due to the budget and graphics engine. About all these character models can do is shuffle stiffly back and forth, and it’s simply astounding that the developer would think that any of this was the right way to go when the previous two games had really locked down an art style and character designs that we could relate to. Other things that don’t help the immediate relatability of Zero Time Dilemma: firstly, you’ll need to have played the previous two games. This is a direct sequel to them, using many returning characters, and the conversations that they have assumes that you’re familiar with what happened previously. Finally, the voice acting is atrocious. Again, in the early stages I was struggling to care about the life or death decisions that my characters were being forced to make because many of the characters had such grating voices that, if anything, I was hoping to knock them out of the story. 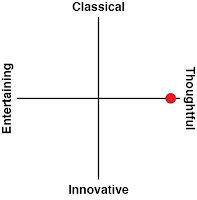 However, all of these criticisms come with a but. If you’re able to put aside the presentation of Zero Time Dilemma, and much like my university professor, you’re able to interact with the game knowing how firmly it’s focused on its own thought bubbles, then you’re going to appreciate just how smart it is. Because Zero Time Dilemma is smart. It’s smart on a number of levels. Firstly, the puzzles. In between the visual novel bits, you’ll find the characters frequently put in an escape room situation, and you’ll need to figure your way through elaborate, multi-stage puzzles, in which you’ll need to scour the room for objects, and then combine or use them to unlock other parts of the room, on the way to uncovering the final key that will get you out of there. I didn’t find them too difficult for the most part, but there’s enough in there to be mentally taxing, and there is a sense of reward for putting the final piece in the puzzle and making your escape. That’s the game’s intelligence on a mechanical level. 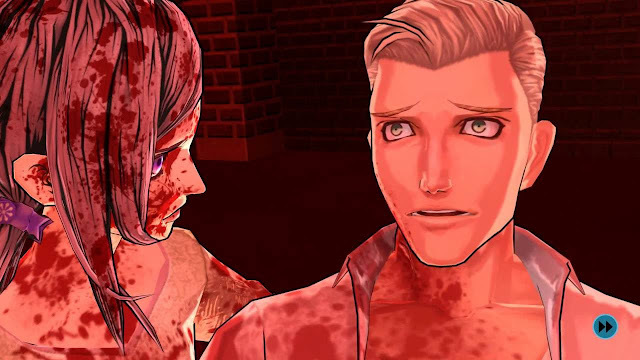 It’s easy to make comparisons between the tone and narrative between this series and Spike Chunsoft’s other Saw-inspired game franchise, Danganronpa, but what sets Zero Time Dilemma and its prequels apart is really those puzzle rooms. They provide a far more complete break with the visual novel storytelling than any of the gameplay bits in Danganronpa, and while that can disrupt the flow of the storytelling (particularly if you get stuck), it’s also a far more effective way of drawing your participation into the game. You’ve got skin in it when you’re not just reading lines of text and blazing through the occasional minigame. Related reading: For another take on this game, here's a review of the original release on PlayStation Vita. 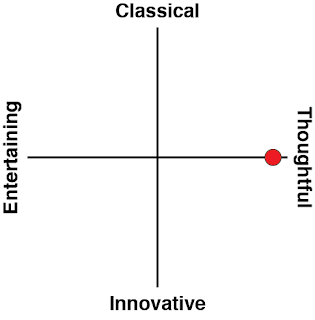 But the real smarts of the game is in the way it explores various philosophical themes. 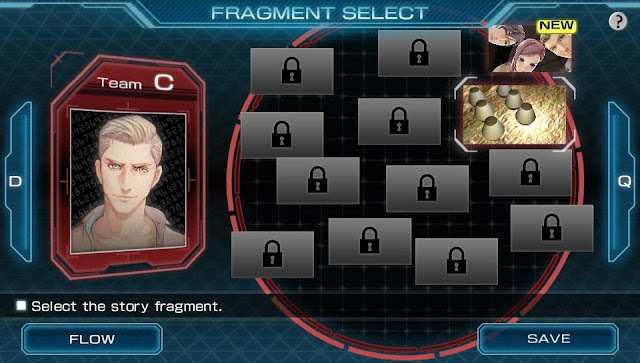 As the title suggests, Zero Time Dilemma is all about having to make impossible choices. As the narrative unfolds you’ll be constantly set with binary decisions to make. In fact, in a twist of brilliance, in the opening cut scene you'll need to select "heads or tails" for a coin toss, and if you get that right you get the game's "good" ending. Name one other game whose "good" ending happens after the first minute, otherwise it's all downhill. That opening scene alone sets the tone that this is a game that's going to be quite subversive to how decisions are generally made in videogames. Usually, we're meant to feel like we're in control of the decisions we make in games, but in this one, we're instead constantly put in our place and reminded that decision making is less about agency and more about tradeoffs. When neither decision is ideal, picking an option to go with boils down to a mix of doing the math, and then putting some solid moral philosophy thinking over the top of it. There’s a team of three characters that have found themselves in a tricky situation; one of them is trapped in an incinerator set to fire in just seconds (obviously resulting in their death). The other is locked into a seat with a gun pointing at them. That gun has, at random, half its bullet chambers filled with blanks, the other half with real bullets. A voice over says tells the team that the sound of a gun firing will open the incinerator door and stop the firing process. You’re in control of the third character, and you’re forced to choose; fire the gun, once, and the person in the incinerator is saved, but there’s a 50 per cent chance that the bullet fired is real and the person in the seat gets a hole in the head. Or, don’t fire the gun, guaranteeing the safety of the person in the seat, but also guaranteeing the death of the person in the incinerator. The solution sounds simple, right? Mathematically, the best chance that everyone has to survive is to take that 50/50 chance on the person in the seat surviving… because the person in the incinerator is guaranteed to survive then. But it’s not that simple in practice, because that pesky moral philosophy then cuts in, and it’s the third person - the one not trapped - that complicates things. Before the gun is fired, the responsibility for the lives and deaths of all three characters has nothing to do with the three characters; it’s the person that imprisoned them that bears it all, and that person is clearly a villain. However, if the third person were to take the gun and fire it, and a real bullet were to be in the chamber, thus killing the person in the chair, the third person has become an active participant in the death of another person. They’re not being forced to pull the trigger, and there’s no greater good being served by risking the life of another; potentially killing one person to save just one is more problematic, philosophically speaking, than the classic trolley problem of killing one person to save a dozen. The act of actively threatening a person’s life to preference another is a challenging discussion. It’s one that has been raging for centuries, and remains relevant today - consider how AI programmers are trying to puzzle through “teaching” self driving cars how to behave in the event of an emergency, and how to decide who lives and who dies. And it’s a difficult one; the game only gives you a couple of seconds to make this decision, but after I made it, I pondered for more than a while over whether I made the right one. It’s possible to immediately replay each scene in Zero Time Dilemma, but I recommend you don’t do that. Stand by the decisions you make. It’s more interesting that way. The game has an interesting narrative structure in that it’s broken up into “fragments” for each important character, and you can play these in any order. Each is a scene, generally with puzzles or moral decisions to make, and the way it’s structured means that you get to see various important scenes from multiple perspectives, which is, in turn, important for reinforcing the impact of the decisions that you’re making for the characters. It means the game can feel disjointed and confounding early on, but as I’ve already established, this game is anything but accessible, and that’s just something that it asks you to wear in return for a great payoff in the end. Because insofar as the narrative is concerned, Zero Time Dilemma couldn’t have been done any other way. It’s a smart and meaningful look at a wide range of different moral philosophy hypotheticals and mind puzzles, from game theory to the prisoner’s dilemma, variations on the trolley problem, and so on. For people who don’t read philosophy books for fun (so, 99.99 per cent of the population), the narrative takes great pains to explain exactly what’s at stake and why the situation is a conundrum. It comes across as heavy handed to those with a passing understanding of philosophy, but otherwise the game simply would have been too obscure. Related reading: This game's main competition is also by Spike Chunsoft: Danganronpa. Matt's review of the most recent game in that series. 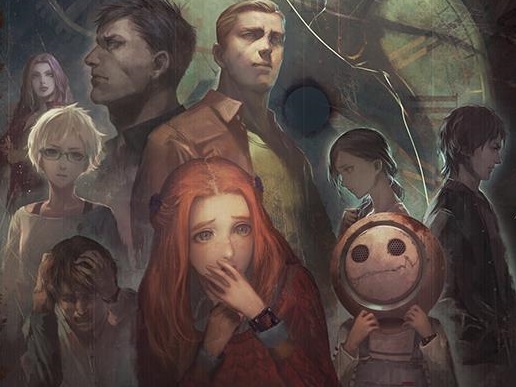 It lacks the charm and wit of Danganronpa, but Zero Time Dilemma, like its prequels, is still valuable, smart, and stimulating. Its presentation really badly hurts it, but once you push past that distaste, what you’re left with is an intense, engaging and intelligent narrative with some thoughtful and well-designed puzzle rooms to sort through.